A new identity and website for a thoughtful and collaborative writer. A writer’s new brand leaves a lasting impression. 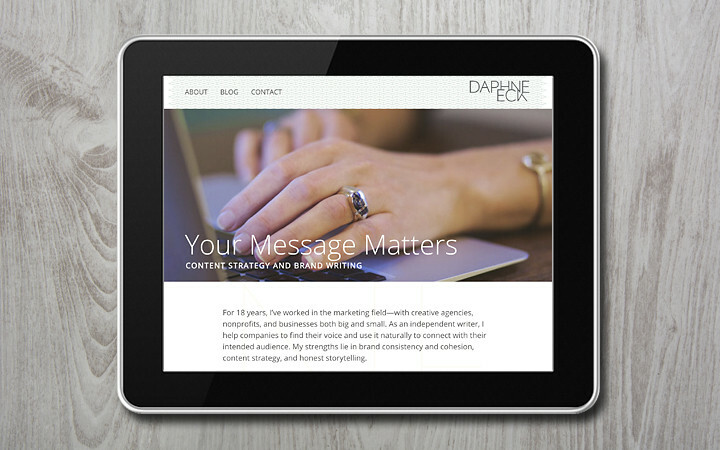 Daphne is a brand writer, thinker and content strategist. Her specialty is helping businesses and organizations find their unique voice and connect with their audiences. 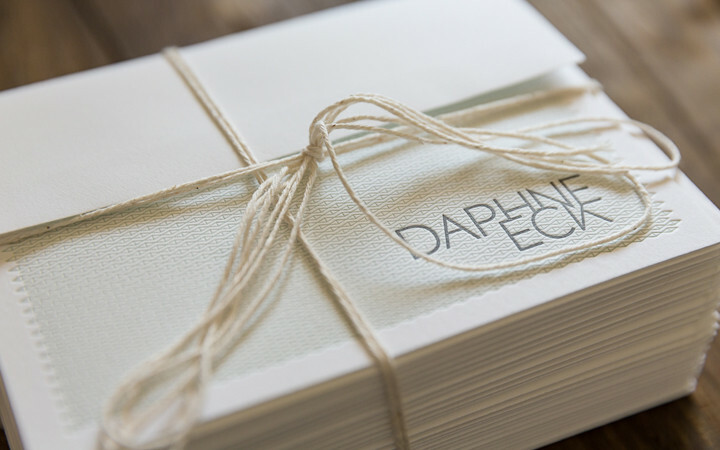 Daphne came to us ready to create a brand that truly reflected the way she approaches her work. She needed a logo, a few key identity pieces and a website to set the foundation for her business. Daphne wanted her brand to facilitate connection with clients in both the corporate and nonprofit worlds, and to also resonate with likeminded creative agencies that might want to partner with her. We’ve partnered with Daphne for many years, so to be asked to collaborate with her on the new brand development was pure joy. Daphne’s professional style is strong yet understated, unique, welcoming and ever attentive to detail. Her carefully honed craft and natural aesthetic inform the work she does for clients, so we knew it would be vital to find a way to reflect that in her branding. Our overall strategy was to convey Daphne’s strength as a writer, her collaboration skills and creative leadership she provides. During the information gathering process, we kept noticing Daphne’s passion for found objects in nature and her love for minimalist design. We challenged ourselves to create a similar framework, while still designing a modern and powerful aesthetic. To do this, we established a light and earthy color palette, and built a refined, custom geometric logotype for her name. 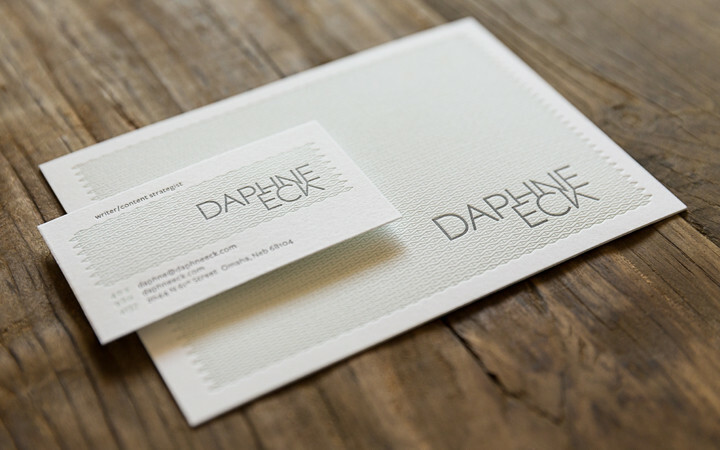 We took a micro perspective on the natural shapes found in the letters of her name and created a pattern that Daphne fell in love with and used throughout her branding. 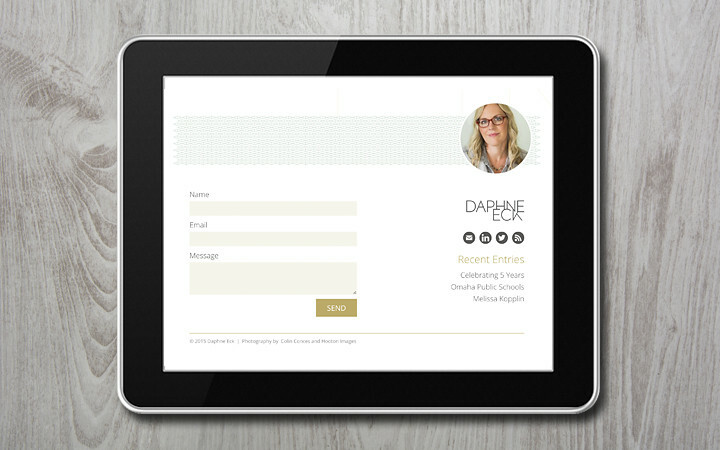 Daphne is very committed to the personalized attention she gives her clients, and we decided that her communication pieces should match the hand-crafted experience she delivers. 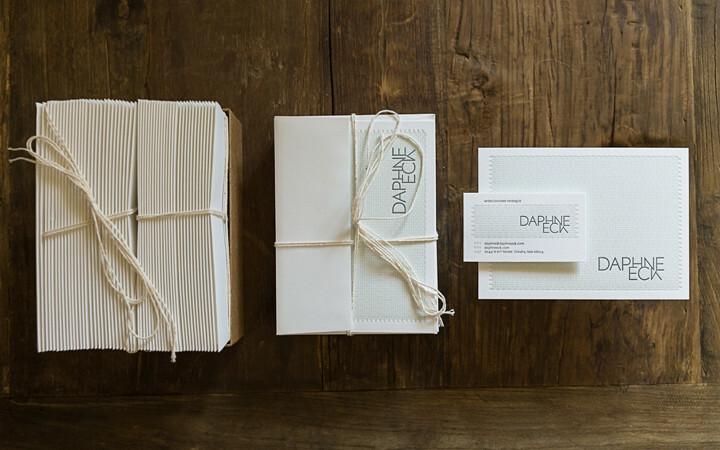 The letterpress business cards and note cards provided just the right impression to reflect her high standards and customized work. For the website, we continued to use an introspective and harmonious tone. 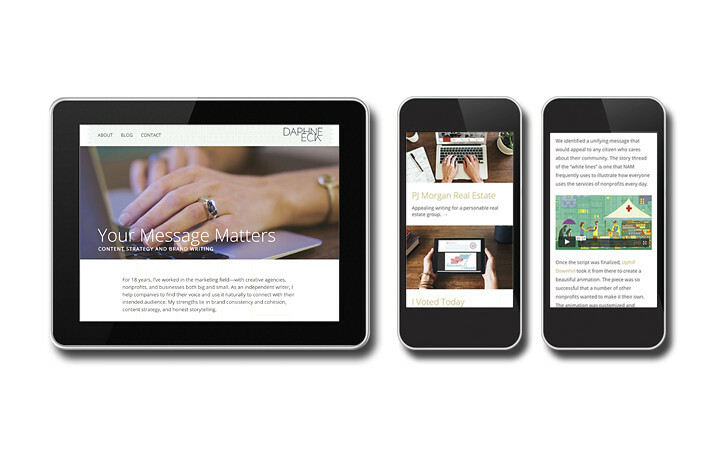 We developed a clear content strategy and visual design that highlighted thoughtful images and subtle graphic elements. 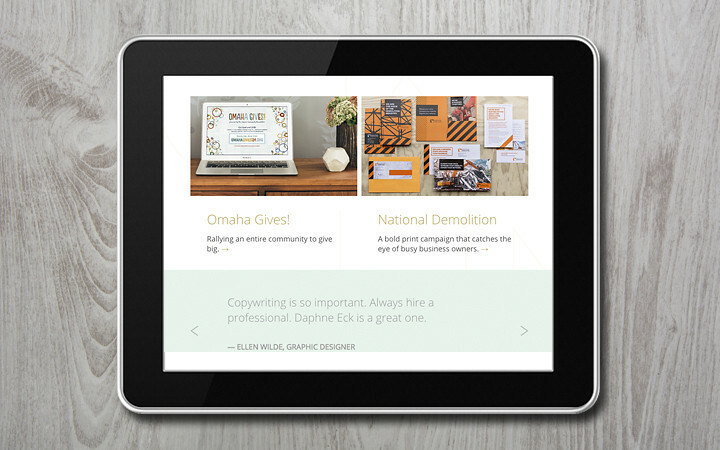 A sample writing feature was added to certain projects so the reader can get a sense of how Daphne crafts communications. Our collaboration continued with the talented Cody Peterson, and with his super hero developer skills, the site was brought to life. 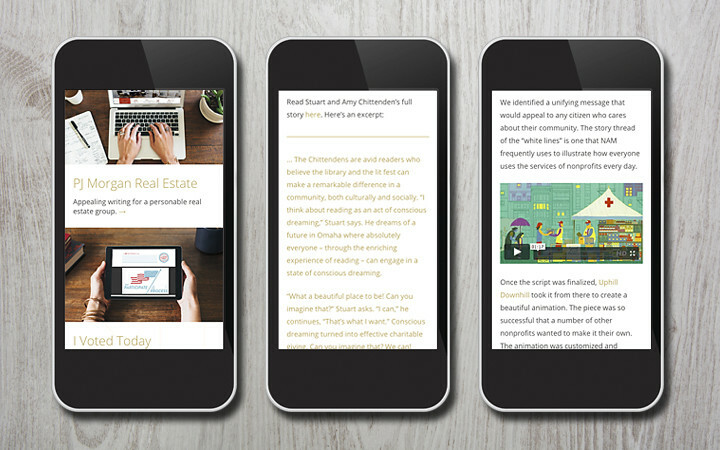 The pages are cohesive, inviting and a pleasure to read, delivering a simple and delightful user experience. In the end, her brand reflects the great attention to detail and refinement, establishing Daphne’s extensive experience, her commitment to the craft of writing and the insightful way she works. All that’s left to do is hire her.